The breakthrough happened after the student took the Bartle's Gamer Profile Quiz and we found out that he was a "killer." Off-the-charts killer, but achievement meant nothing to this student. Just like grades. No, we haven't identified the next school shooter, and I sure wish that Bartle hadn't named one of the four gamer profiles "killer" -- but nonetheless, this student identified with this profile. Jane McGonigal mentioned it in her Gaming Can Make a Better World TED Talk when she discussed an epic meaning. My so-called "killer" student (and we really should rename this when applying it to education!) simply saw things as a battle between good and evil and wanted to fight on the side of good in an epic quest to make the world a better place. Points don't matter in gameplay, and grades don't matter, either. But when we tweaked the kinds of work he was doing in our Gamifi-ED project to focus on "world-changing games," he was suddenly engaged. Now his face lights up when he sees me. He's one of the first kids to class. He's an engaged gamer and, finally, an engaged student. My ninth grade students have partnered on an epic quest with grad students at the University of Alaska Southeast and members of the Gamifi-ED OOC to study serious games, create an encyclopedia of serious games, and ultimately to create their own serious game in Minecraft. This adventure merits a post of its own, but for now, let's go through the essential elements that we should consider as gaming and education come together. Game mechanics are part of game theory. The problem with most attempts at gaming in education is that educators mistakenly think that if you give out a badge or slap points on it, you've gamified. This is wrong. Game theorists have uncovered 24 ways for truly motivating gamers to participate and engage. If you're going to engage your students using any form of gaming, you should understand game mechanics. As we saw with my "killer" student, there are four game-player types using this psychological evaluation. You can take the quiz to determine which type you are. Realize that you should consider all four of the player types as you design your experiences. Sixth grade teacher Michael Matera wowed me and other members of the OOC as he shared how he has completely gamified his sixth grade classroom. (See the video from his Google Hangout below.) He also delineates the difference between grading and gamifying, as privacy requires that you not publicly share grades. The other important element I've adopted is that badges should be printed out and handed to students (they love putting them on the front of their notebooks, he says). He also shares how much it motivates a love for learning. I'm reminded of the SAMR model of technology integration in that the final step is redefinition -- what happens when you truly gamify a classroom. To risk sounding cliché, gamifying the classroom is a game changer in every way. During the Gamifi-ED OOC, I was astounded to see higher ed, elementary ed, and everyone in between share countless ways that gaming can enrich the classroom. From donated Xbox, PS3 and Wii systems to games from various app stores, there are so many ways to enrich learning with the right game. As my students compile our encyclopedia with the higher ed teachers, we're finding game experiences that tackle serious issues, such as depression, genocide in Darfur and the Arab-Israeli conflict in the Middle East, with respect and learning. Education app stores are a virtual Wild West of unclaimed, unverified games and apps. Using a rubric developed by the higher ed students, we've already tested more than 20 games (and have another 60 in process) with students and educators ranking them by research-based education best practices. The highest any game can score on our scale is 30. Thus far, we've found only two games that have broken 20, and only one math game -- Cockroaches vs. Algebra -- has gotten close, scoring 19. Social media and word of mouth recommendations have taken us this far, but it's time for some serious testing of serious games to determine which ones are appropriate for classroom use. Instead of relying on unknown algorithms to determine the best learning games, the education world needs a vetting process that will take us beyond non-teaching game company employees who currently determine what's hot and what's not. Gamifi-ED is definitely a step in the right direction, and if you or your student testers want to join, just contact us. Gaming in education is already full of experts. 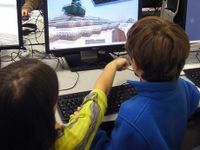 Minecraft, World of Warcraft and even a new site called Growtopia are all places where we can share, grow and learn. It's time to move forward into best practices, curation methodologies that will truly help us apply education theory to gaming, and an understanding of gaming that will help us apply gaming theory to education. I'm excited about gaming as a powerful "killer" tool in a 21st century teacher's toolkit. Let's take what we're doing farther.